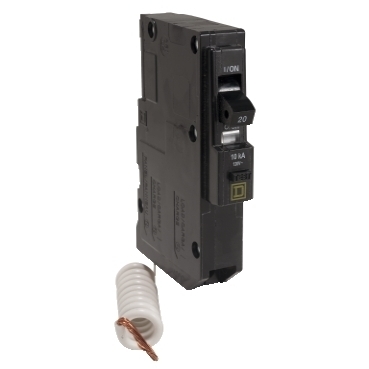 Detailed Description: Schneider Electric/Square D QO™ 1-Pole Miniature circuit breaker features thermal magnetic molded case for extra protection. Circuit breaker has current rating of 20 Amps, voltage rating of 120 VAC and interrupt rating of 10 kilo-Amps. It accommodates copper wire size of 14 - 8 AWG and aluminum wire size of 12 - 8 AWG. It offers effective class B ground fault, overload and short circuit protection for added safety. The 1-Phase circuit breaker measures 0.750 Inch x 2.910 Inch x 4.120 Inch and provides long-time instantaneous trip functions to perform efficiently. It is ideal for QO load centers, NQ/NQOD panel boards/interiors and speed-D switchboard distribution panels. It features reliable pressure plate terminal and VISI trip indicator for convenience. Breaker requires one space and uses plug-on mounting to hold firmly. Circuit breaker is UL listed/CSA certified and meets Fed. Specs W-C-375B/GEN standards.